It is also known as skeleton lake with mystical beauty. You will be staying in a geust house at Jobra and Chatru. Accommodation on all other days will be in tents (2-3 per tent). Himachal Pradesh is a beautiful place which has pristine snow clad mountains due to which, it becomes one of the most toured states in India. The mountains of this state are used for many adventure sports and trekking is one of them. 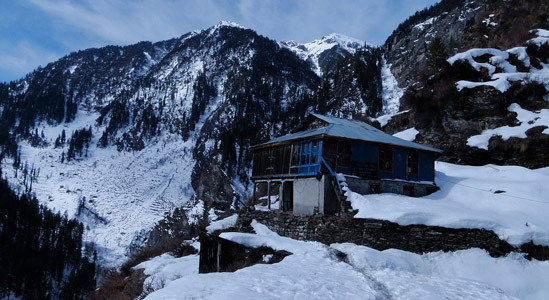 Hampta Pass Trek is considered to be the easiest treks in Himachal Pradesh. This trek has a lot of variation in the trails which makes this trekking expedition exciting. 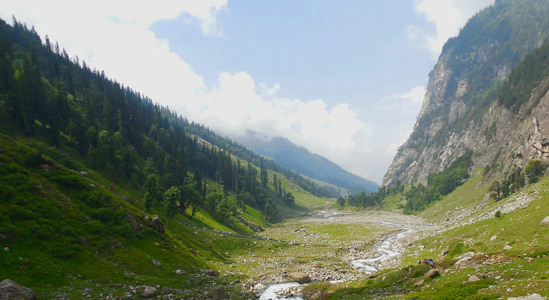 Hampta Pass is a wonderful crossover trek which amidst thick forest nestled with lush green meadows, alpines, colorful birds, river flowing throughout this trail as well as the silk-blue streams flowing down the mountains. There are only few treks which offers almost everything that one wishes to see on a Himalayan trek and Hampt Pass is one of them. During this trek you will experience scenic beauty of the landscape making you feel like you are in a new world each day. This journey which will be captured in your mind for lifetime. 2 hours drive from Manali to Jobra, and 30 minute trek to Chika Campsite. Our next destination is Balu ka Ghera. This trail is moderate and has short meadow walk as well as boulder section for a couple of hours. Further the trail leads us all the way to loose rocks. 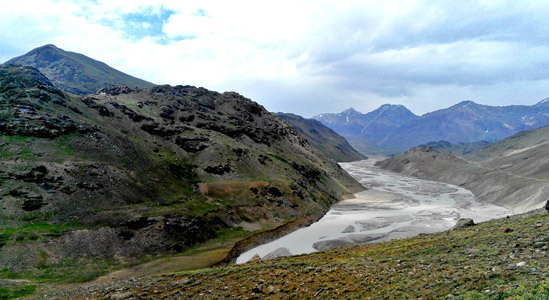 You will find mountains in front of you and our trekking will start along the Rani River to a valley. After crossing the valley we come out of Chika. We will then reach Chota Balu ka Ghera and continue trekking along the river. Soon we will reach our destination. Third day trekking will include two stages. First we will climb to Hampta Pass and then to Shea Goru. The climb is strenuous all the way up to Hampta pass. We will walk at a steady pace further on this trek. After an hour of going further on this trail you will come across your first serious incline. Leave camps in the morning. 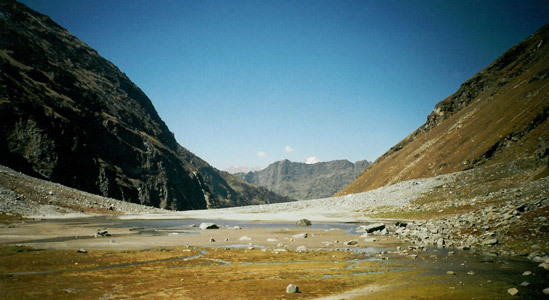 Trek starts by the crossing of river which is near by the campsite. And crossing this river is difficult experience in itself. Lets take it as a surprise for the trek. Approx. half trek is easy & full of descent. After downwards you see the expanded valley of river Chandra. Chhatru is the road head. From Chatru ,hire taxi for a road drive to Chandratal. Reach Chandratal by late afternoon. After spending time at Chandratal move back to Chhatru by evening. Camping in Chhatru .Please note that the road to chandratal is closed at times due to landslides or snow. In case the road is found closed the Chandrataal drive will not be done. Drive from Chatru to Manali. The trek expense of Rs. 9,300 + 5% GST takes care of all expenses of the trek from Chika to Chatru. Backpack offloading charges - If you wish to offload your backpack, there will be an additional charge of Rs. 1,680 + 5% GST. The backpack cannot weigh more than 9 kgs. Suitcases/strollers/duffel bags will not be allowed. Please note that charges will vary for last minute offloading in case you decide to offload your bag after reaching the basecamp (Rs. 1,920 + 5% GST). Online offloading in advance is possible up to two days prior to the trek start date. Buffer day – It is mandatory to have this extra day as any bad weather or rain will delay your pass crossing. If buffer day is utilized, you will need to pay Rs. 2,325 + 5% GST. This amount is to be handed over to your trek leader.